Stuck for words? 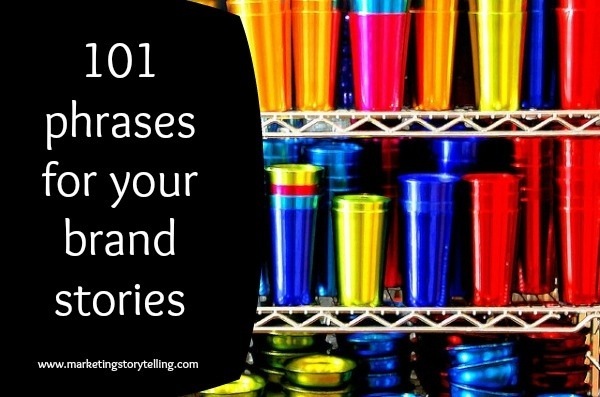 Here is my enormous list of 101 ideas to help you come up with some extra words for your next brand story. You could be writing about your business, your campaign or an individual. These phrases should also help trigger angles for brand storytelling ideas. 14. Did you know that? 101. Our campaign was run primarily online. That’s it, a long list leaving you enough room to play around with the words. The next time you’re suffering from writer’s block and need an angle for a story, you can recycle the ones you’ve already used and just re-adjust your angle for the topic at hand. For more on how to use brand storytelling for your business, read my blog post on how to use brand storytelling techniques. To receive more tips, sign up to my newsletter below. VIPs also receive special offers and discounted rates on services. Original image by Thomas Hawk. Thanks Rhonda for this sensational list. So valuable and now there’s no excuses for not having anything to write about. These are great. I am always on the look out for new phrases etc as I hate using the same sayings over and over again. Know what I do sometimes? I flick through a magazine, I close my eyes when I see an interesting article, then I do “eenie meenie miney mo” and put my finger on the page. Whatever my finger lands on is the sentence that motivates the next blog post. Give that a go. WOW Rhonda that is some impressive list!!!! What’s your fav.? I think my fave is “We dream of a future where you never have to wait for your copy” because I’m a book and movie lover and tired of waiting for hardcopies or DVDs to get to Australia. We are ALWAYS behind and if we download it’s illegal. Brands (publishers and distributors) need to hurry up and catch up with technology. I am amazed, I got through the list. They were all thought provoking and definitely food for thought. Thanks, Tamara. I hope they help. Great list. Have bookmarked for clients.